Our products are fully interoperable, mobile, durable and easy to maintain. Our primary goal is to provide our customers with superb mobile training and simulation products. We create the most innovative and cost-effective mobile training and simulation products that can easily be deployed anywhere at any time. We carefully analyse the customer’s needs and requirements, ensuring they get tailor-made product far beyond their expectations, regardless of how unique their requirements are. SA-S is personal weapons trainer with the possibility of fast upgrade to a 40 mm grenade launcher training system. Any kind of small arms weapon can be simulated with no additional adaptation. SA-S features training using either a weapon replica or a real weapon with training ammunition. Highly realistic interactive training is achieved by virtue of an interchangeable smart display mounted on a picatinny rail. SA-S offers fully interoperable training, supported by real-time 360° VR environments. MANPATS-S features interoperable and highly immersive soldier training using a combination of exact weapon replicas and real-time 360° VR environments displayed in an integrated micro monitor within the aiming device. Up to 6 wireless systems can run simultaneously ensuring qualitative squad training. Highly realistic interactive training and advanced After Action Review guarantee outstanding results. Several RGW90 and PZF3 systems have already been successfully deployed around the world. MANPATS-S can be further modified for any system on the market, such as: ALAC, NLAW, RGW60, RPG, etc. MANPADS-S is a fully interoperable simulator for Portable Air Defence Systems such as: Stinger, Strela, IGLA, IGLA-S or any SAM or GTAM. MANPADS-S is a multiuser, indoor training system that simulates various scenarios encountered by SAM crews. Exact weapon replicas support interactive squad training in real-time 360° VR environments screened within integrated display. Up to 6 wirelessly connected systems can run simultaneously in one scenario. Igla and Strela versions of MANPADS-S systems are already deployed and can be easily modified for any MANPADS system on the market. M-S is a mortar crew trainer featuring training in all weapon use procedures with a focus on the entire firing cycle, thus improving the entire crew’s skills and proficiency. 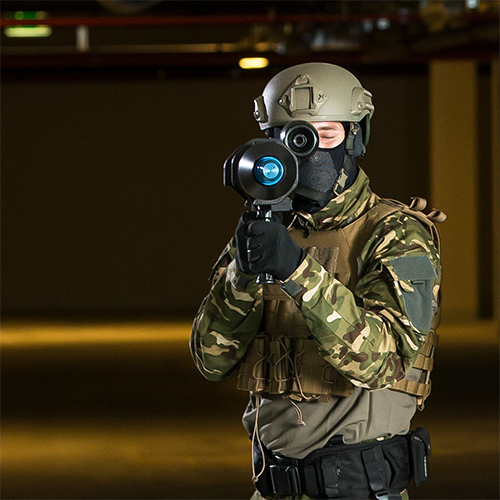 It features highly immersive training, using a combination of weapon replica and real-time 360° VR environments. Patented ‘Intelligent grenade’ design ensures that all possible procedures are properly trained. Up to 6 systems can be wirelessly connected ensuring simultaneous real-time training. M-S design allows rapid modification for different types of mortars ranging from 60 and 81 to 120 mm. Highly realistic training accompanied by FO-T ensures fully interoperable training. RWS-S is fully modular training system for the realistic training of entire remote weapon station crew. It serves for the real-time 360° VR training of a gunner, commander and driver of any vehicle (wheeled or tracked) equipped with a remote weapon station. The system’s patented modular design ensures interactive multiuse and complete interoperability with any given system. Modularity enables smart-in-vehicle installation ensuring a realistic training environment. Various versions of RWS-S simulating remote controlled weapon stations have already been deployed. MBT-S is a compact training system for the real-time 360° VR training and education of crews and crew commanding staff for all T-72 and M-84 main battle tank variations. MBT-S is compact, easy to transport and simple to operate. The system’s patented modular design ensures highly interactive multiuse and full interoperability. M-84 versions of MBT-S have already been deployed and can be further developed for any MBT system on the market. FO-T is a cost-effective portable simulator for training artillery forward observers in infantry units and enables interactive training for target detection, fire requests, fire organization and direction activities. It features accurate representation of the splash effect and damage impact on various targets in 360° VR environments. FO-T comes with an interactive real-time multi-touch GUARD Control Desk, which also serves as an interoperability module for the entire range of Guardiaris training and simulation products. The GCD is the ultimate all-in-one solution for instructors and trainees and can be added to any Guardiaris product. It is fully interoperable, interactive and features user-friendly interface for exercise planning, execution and evaluation. A large multi-touch screen and touch friendly user interface guarantee the shortest possible time spent in exercise planning and a best-in-class After Action Review procedure. The revolutionary user interface design has eliminated the mouse and keyboard from the training process, since all the actions are executed only with the fingertips. Highly immersive training in real-time VR environments. Projected on either flat or curved projection screen (up to 360°). Free movement inside GUARD DOME. GUARD DOME can be used with all other Guardiaris products.